Listed below are some of the events at the 2006 US Go Congress. Please click on each event to learn more. The US Open Tournament is a six-round, Swiss-McMahon Tournament, one round per day. The player with the highest score will be declared the new US Open Champion. Schedule. All rounds will begin at 9:00 am. Round 1 may start a little later due to announcements made at the beginning. Registration. Players in the US Open should confirm their participation upon check-in to the Congress. If you change your mind about participating, or if you did not confirm your registration, you must see one of the TDs (Tournament Directors) by 10:00 pm Saturday, August 12nd. Late registrations will be NOT be accepted. Entry Level. All players who have an AGA rating are REQUIRED to enter at a rank consistent with their latest AGA rating. Exceptions to this rule will be allowed only with the explicit approval of the TD. Players who do not have AGA ratings must enter at a rank approved by the TD. Byes. If you are registered to play but wish to skip any game of the tournament, be sure to request a "bye" from the tournament directors before 8:00 pm the day before the round you will miss. Every year, it happens that unexpected events cause players to miss one or more rounds. If you must miss a round, or leave the tournament before Round 6, please tell the TD as soon as you can. If you forget, or just leave, your opponent will have no game to play and would be justified in being upset with you. And you will automatically lose the game. Time Limits. For high Dan players (4 Dan and above), the basic time limit is 120 minutes. For all other players, the basic time limit is 90 minutes. If players with differing time limits meet, the longer allowance is used for both players. The overtime allotment will be 5 periods of 30 seconds each. See the "General Tournament Information" section for a further explanation of overtime. Sealed Moves. Sealed Moves can be used for Lunch breaks, see the "General Tournament Information" section. Handicaps. Most games are even; compensation to white ("komi") is 7.5 points. In the lower Kyu sections, the TD will assign handicaps as appropriate to compensate players for being matched "out of band"; these will be based on band difference, not rank difference. Compensation to white in handicap games is 0.5 points. Winners. First place in each section goes to the player with the highest McMahon score. Ties will be broken in the manner described in the "General Tournament Information" section. There will be several prizes per section. The player with the highest McMahon score will be the new US Open Champion. Sections. Players who wish to play in the Open Section must have an AGA rating of 7.0 or better, or the permission of the directors. The directors reserve the right to change the minimum entry rating of the Open Section based on the size of the tournament field. Sections may vary depending on the number of players of each rank participating. Placement in a section depends on one's entering rank. The Self-Paired Tournament will consist of any game you want to play during the Congress that both players want the AGA to rate. You may play any other Congress attendee. The AGA will rate a maximum of three games between any one pair of players. Play as many games as you like, any time during the week. Time Limit. Either player may request the use of a clock. If a clock is used, time limits are set by mutual agreement. However, for a game to be AGA rated, it must have a minimum of 30 minutes per player and byo-yomi of five 15-second segments. (We suggest that 45 minutes basic time is most in keeping with the spirit of this tournament.) Any deviations must be approved by the TD. Duration. The tournament begins after registration on Saturday, August 12nd. All games must be completed and results reported by 2:00 pm on Saturday August 19th. Pairing. Opponents are self-paired. Each pair of opponents may play only three games with each other. Be sure to agree to the conditions of play before you start. For example, if you are frustrated by slow play, use a clock. Ratings. Players begin the tournament on August 12th with their AGA rating. Players who have no AGA rating will begin at the rating corresponding to the middle of their stated ranks. (For example, a stated rank of 3 Dan corresponds to a rating of 3.5.) Each morning updated ratings will be posted based on the previous day’s results from the US Open and Self-Paired tournaments. Please check both your rating and your results for accuracy. Game Reports. You will receive self-paired tournament stickers after registration, to be applied to the game reporting slips used for each self-paired game. The winner should be circled and the loser should sign the slip, which is then turned in at the reporting area. Disputes. Try to avoid them as much as possible! Remember that tournament rules apply and take them seriously. 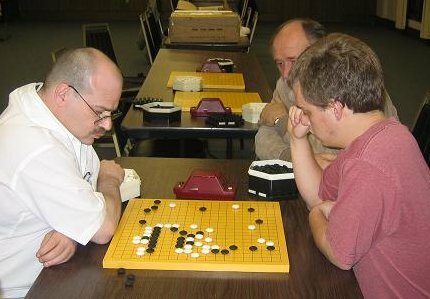 The rules themselves allow for resolution of most disputes by continuing play. If a serious disagreement arises that the players cannot resolve themselves, they may consult the director or some other agreed authority (for example Kyu players may abide by the opinion of a strong Dan level player), but this should be a last resort. If both players have either positive ratings (Dan) or negative ratings (Kyu), then simply subtract the smaller number from the larger to get the Rating Difference. For example, if a player with a rating of 3.1 were to play someone with a rating of 3.7, the Rating Difference would be 0.6 points, and the handicap would be for white to get 0.5 points komi. If one player has a positive rating and the other player has a negative rating, then account must be taken of the fact that there are no ratings between -0.99 and +0.99 (ranks go from 1 Kyu to 1 Dan, with no 0 Kyu or Dan.) Add the absolute value of the ranks and subtract 2.0. For example, a player with a rating of 2.4 paired with a player with a rating of -1.2 would have a Rating Difference of 2.4 + 1.2 - 2.0 = 1.6 and therefore play with a handicap of 2 stones. Champion: the player who records the greatest excess of wins over losses. Hurricane: The player who records the greatest number of wins. Giant Killer: The Kyu player who wins the most games against Dan players (also known as the "Dan Killer" award). Keith Arnold: The Dan player who wins the most games against Kyu players (also known as the "Kyu Killer" award). Grasshopper: The player whose rating increases the most during the tournament. Straight Shooter: The player who scores the most victories against players of consecutive ranks (based on ranks stated on name tags). For example, victories against a 3 Dan, a shodan, a 1 Kyu, a 2 Kyu, and a 3 Kyu would total a straight shooter score of 4. Dedicated: The player who plays the most games. Sensei: The player who plays the most games against weaker players (also known as the "Teacher" award). Faithful: The player with the smallest rating change. Philanthropist: The player with the most losses. Optimist: The player with the largest rating decrease. There is no need for players to keep track of their progress in various categories to determine their eligibility for prizes; the TD will do that. Description. 4-round Swiss, by invitation only. Schedule. All rounds begin at 7:00 p.m. Participants must attend a short meeting at 6:30 p.m. on Sunday, August 3rd, to discuss tournament arrangements and Ing rules. Time Limit. 90 minutes per player, 5 byo-yomi periods of 1 minute each. Rules. Ing rules, Ing counting, Ing compensation of 8 points for white. Prizes. The prizes have been generously provided by the Ing Foundation. Commentary. Professional players will analyze selected games during each round. The Congress solicits volunteers to act as game recorders during the tournament. Ideally, we will record all 32 games and print and distribute them later. Please assist us in this endeavor. Description. The Redmond Cup is the North American youth Go championship. Winners qualify to be chosen to play in the World Youth Championship in 2007. Participants play by invitation only. Players. Preliminary rounds of the championship have been played on the Internet courtesy of the Internet Go Server (IGS) to determine finalists. The finalists will play in a multi-round final this week to determine the champions of the Junior and Senior divisions. Description. Round-robin in groups of 6, with playoff rounds between table winners. Time Limit. 10 minutes per player; no byo-yomi -- when time expires, so do you. Handicaps. Same as in the US Open. Winners. Table winners will have a playoff on a later day (to be determined by the TD) under a knockout format to determine overall Dan and Kyu champions. Description. Team tournament with teams made up of one male and one female. The players may not consult with each other during the game. There will be 2 rounds. Sponsored by NKB Inc.
Time Limit. 45 minutes per team; no byo-yomi. Handicaps. Based on the difference in the average team strengths; there will be no handicaps at the top table. Top Table. The Top Table comprises the top 4 teams both eligible and willing to go to Japan in the fall for the World Amateur Pair Go Championship. Contact the Congress Office for rules for eligibility requirements. Prizes. Prizes wll be announced soon. Description. A 4-round, Swiss McMahon system, one-day tournament. Chinese counting will be used. Schedule. Wednesday August 16th in the Main Playing Area. Round 1 - 9:00 a.m. Round 2	- 10:30 a.m. Round 3	- 2:00 p.m. Round 4 - 3:30 p.m. Registration. Sign-up/show up by 8:45 am. Late arrivals may be permitted at the discretion of the TD. Time Limit. 45 minutes per player; 5 byo-yomi periods of 20 seconds each. Handicaps. Most games are even; compensation to white ("komi") is 7.5 points. In the lower Kyu sections, the TD will assign handicaps as appropriate to compensate players for being matched "out of band", based on band difference, not rank difference. Compensation to white in handicap games is 0.5 points. Winners. There will be prizes for each award band and an overall prize to the tournament winner. The award bands will be determined on the day of the tournament based on entries. Special Events content missing as of 7/12/10. Description. 5 round round-robin in groups of 6, with playoff rounds between table winners. Time Limit. 15 minutes per player; no byo-yomi. Handicaps. A handicap table will be posted prior to the tournament start. Time Limit. 20 minutes per player; no byo-yomi. Winners. Table winners will have a playoff on a later day (to be determined by the TD) under a knockout format to determine the prize-winning champion. Description. A collection of various Go alternatives. Possibilities include Team Kriegspeil Go (no one sees opponent's or teammate's moves), large board Go (23 x 23 or more), Zen Go, Joker Go, Go on unusual surfaces, 3-D Go, musical chairs team Go, Go Moku, Go Fish, and more. If you have an idea, let Terry or the Congress staff know, and we will see what we can arrange. Winners. Winners? Can there be any winners? We will try to match the spirit of the event. A nice number of vendors of Go related books, equipment and related items attended the Congress. 9-on-1 Simultaneous Play. There will be afternoon and evening sessions of 9-on-1 simultaneous play with the professionals, open to all players. Players must sign up in advance for these sessions; sign-up sheets will be posted the evening before. As a matter of courtesy to your fellow Congress participants, please do not sign up for more than one game until after Tuesday; if you have not scheduled a game by Thursday and wish to do so, please let the staff know, and we will give you priority. It is your responsibility to be in the appropriate area before the session is scheduled to start. If you are not seated by the appointed time, you will forfeit your place to an alternate. You may not save a seat for a late player. 3-on-1 Teaching Games. All Dan level players are eligible for one 3-on-1 teaching game each. Please do not sign up for more than one game. As this is a more serious teaching experience, and the professional can play sitting down, players enjoy greater latitude with respect to the rate of play. Lost games should still be resigned so that time remains for comments on each game. Pro Clinics. Interested top rated players (priority by strength for this event only) are invited to participate in pro clinics. You will be organized into six person study groups, and you will meet four afternoons with professional players. In order to participate, a player must be willing to attend all four sessions. A different pro will be scheduled each day. In return for the privilege of participating in these clinics, each player may be asked to give some teaching games to Kyu level players sometime during the week. Game Commentary. To accommodate all players, we will try to hold analysis sessions, both in the afternoon and evening, in which a professional player will comment on a game that was played in one of the Congress tournaments. Comments may be limited to openings or cover entire games, depending on the inclination or judgment of the professional commentator. Players of all strengths are welcome to volunteer their game records (providing they are neat and legible) for analysis. Private Lessons. We will help some of the Pros schedule private lessons when they are not involved in an event. Rates, formats, and times will be posted with sign-up sheets. The Chuck Robbins Challenge. This year, for the first time, the Go Congress will host the first annual 'Chuck Robbins Challenge.' As you all know, Chuck Robbins, the grand title holder of the AGA all-time records for both most go events attended and most rated go games played, has never been seen in anything but a white dress shirt while attending his innumerable events. This year might be different. Chuck has agreed to put his sartorial custom on the line by battling up to 20 kyu players simultaneously. If he wins more than half of his games, he gets to keep his shirt and winners get a collector's "I Beat Chuck" t-shirt. But if he loses more than half, he must wear a colored Congress t-shirt, something he has not done in over ten years of attending Go Congresses. Players who have never attended a Congress before get priority seating.